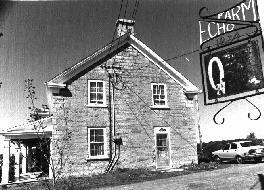 Echo Farm on Regional Road 73, just north of North Gower, has one of the area's most interesting early houses, a fine stone building that was constructed by one of the area's founding families, the Craigs. The land that the farm was established on was part of a four hundred acre block extending from both sides of Regional Road 73, back to Fourth Line Road. It was purchased by Hugh Craig, who divided it among three of his sons, James, Robert and Hugh, and his niece's husband, Robert Moffatt. The purchase appears to have been arranged in 1834, and finalized in 1840. 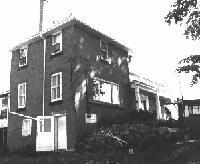 The stonemason was Mr. McQuarrie, who had built the Phalen house (now home to Strathmere) the year before. The carpentry was done by Mr. Morrell. Both were tradesmen who had apprenticed in Scotland before coming to Canada. The lime for the mortar was made in a lime kiln behind the house. The lime for the plaster came from Perth. The mortar was mixed with sour beer, with hair added for additional bonding. The stone was drawn in winter from Morton's Mill, which is about 14 miles past Richmond on the present Franktown Road. It was also the source of stone for Holy Trinity Church. The lumber came from the farm's woods, except for the pine, which came from Ottawa. (The pine that was used as flooring wore quickly, and had to be covered with hardwood, which again was cut on the property.) The lumber was sawed at Storey's mill in Manotick, apparently across from Dickinson's grist mill and soon after acquired as one of the Dickinson properties. Lumber for the Phelan house was milled there as well. The carpentry work included all the doors, windows, baseboards, and so on; the cost for this work was one hundred dollars. In 1915, a survey was conducted for Highway 16. (This part of the highway is now Regional Road 73.) It was constructed of cement, and completed in 1921. Gravel was sold from the farm for the highway construction; the proceeds were used to finance an addition to the house, the block kitchen that replaced an earlier wooden kitchen. The blocklayers' next job after this was to build the block house on the hill in Carsonby belonging to Howard Moffatt. The veranda on the front of the house was built in 1924 and remains the same, except for a railing around the top. It covers the date '1865' inscribed in a stone over the front entrance. A new front door and casing was put in at this time, changing the appearance of the front entrance. The original large stone that was at the front door is still used as a step, onto the present veranda. Electricity and indoor plumbing were installed in 1937. There were no other changes until the house was completely renovated in 1972, and divided into two separate living areas. 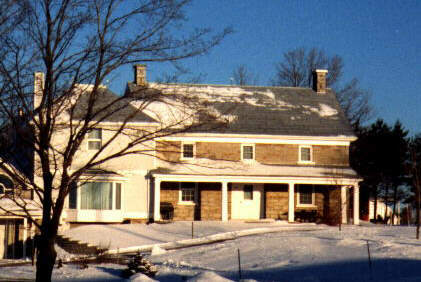 The final addition was added in 1989 as an extension that incorporated the kitchen built in 1921. This left the original stone house as a separate unit. The property is known as Echo Farm. Before all the traffic arrived, on a quiet night, the voices spoken from the veranda could be heard echoing back from the barn. 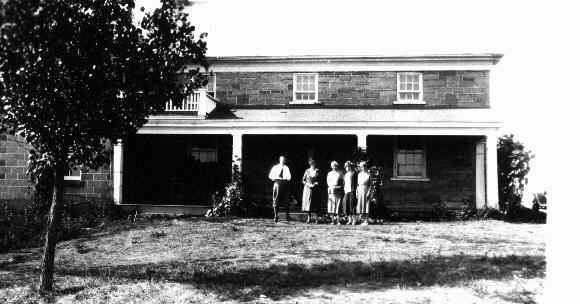 In Captain Hughie Craig's day, the hill on the property was known as Castle Hill, and the house as Castle House, because it received many visitors. They were made welcome by Captain Hughie, who was popular and commanded great respect. If there was a commotion in one of the North Gower hotels, when he walked into the room, you could have heard the proverbial pin. The Craig family hosted a number of church parties in accordance with custom of the time, to raise money needed for the church. 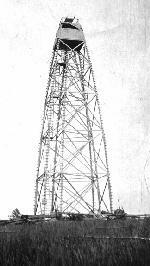 In 1903, the National Geodesic Survey erected a 96 foot tower on the hill behind the house. It was used to map the surrounding area. It was said to be the highest hill for forty miles. (The top 10 feet has since been removed.) The tower remained until 1913, when it blew down. A replacement was built on the Shipman property. A monument stands in the corner of the field, marking the location of the tower. It makes a good story, but the tower was not on the 45th parallel, halfway between the equator and the pole. In fact, the 45th parallel is close the the settlement of South Gower. 1908 - rock elm was cut in the winter. Timbers were cut, some over 45 feet long, and squared to 12 to 18 inches square. Logs under 12" were cut in the round. Five men worked to square the timbers. Hugh L. Craig drew them to Kars. They were sold to Mr. MacDougall, of Vankleek Hill for 35 cents a cubic foot. 1928 - a hail storm struck, blowing windows out of the barn, the roof off the barn, a silo down, and devastating crops. It was necessary to draw hay in from Nepean the following winter. When a furrow was ploughed in the potato field in the fall, it revealed a full crop of potatoes; they had grown enough at the time of the hail to have survived without their foliage. 1905 - the barn across the road, built in the 1880s, (the one with the Echo Farm Storage sign) was turned to its present position, and it was extended to its present size. The work was done by Tom Cummings, who built many of the large barns in the area. We are indebted to the Stratton family, and particularly to Mr. Craig Stratton, who made this information available. We were also able to listen to a recorded interview with Mr. Hugh L. Craig, the owner of Echo Farm for a number of years. Mr. Craig worked the farm until he was 90. His remarkable memory preserved an extensive knowledge of the area. He was 91 at the time of the interview, in April 1976. He lived from 1884 to 1986. His grandfather was Captain Hughie Craig, who was the first owner of Echo Farm. Hugh L. Craig, 93, photo from Citizen article on residents of Carleton Lodge, June 20, 1977. Reproduced with permission of The Citizen.